Africans: Why The Prevalence Of Anti-Gay Hate? Last week, I read about Washington DC’s City Council agreeing to recognize out-of-state gay marriages by a vote 12-1. The Washington Post reported that numerous black churches rallied against the bill, and when it passed, demonstrations turned so loud and angry (near rioting) that the police had to forcibly clear the hallway. Marion Barry, who won a City Council seat after he lost the the Mayor’s office amid a drug scandal, was the only councilman to cast a “no” vote. 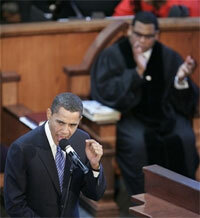 He warned of an African-American uprising. I’m totally cool with free speech opposing these policies (“I don’t agree with what you say, but I will defend to the death your right to say it.”) and peaceful protests should always be protected. But threatening insurrection really goes beyond acceptable, and begins to cross over into dark and violent territory. This made me realize something. This is the same violent homophobia we’ve seen from African countries and some Afro-Caribbean nations like Jamaica. For people of African descent of such disparate locations, backgrounds and situations to respond so similarly to gays, this stuff must be embedded deeply in Africans’ cultural DNA, their collective memory. Early this month in Senegal, Muslims exhumed the body of a man rumored to be gay from an Islamic cemetery. His family reburied him, only to find his corpse again dug up and dumped in front of their home the next day. His family has now interred him in a hidden grave. Per Jamaican law, convicted homosexuals face up to 10 years in prison. But the police also love extrajudicial punishment of gays, and often beat them in public, in concert with vigilantes or on their own. Angry neighborhood mobs routinely assault and/or chase gays out of town, forcing them to abandon their homes and belongings. The story is typical. Once a person’s sexuality becomes known to family or community, they are at risk. Amnesty International has interviewed many people who have been forced to leave their areas after being publicly vilified, threatened or attacked on suspicion of being gay. They face homelessness, isolation or worse. What’s up with all the anti-gay hate from people of African ancestry? Obviously there are plenty of Africans friendly to gays (I get that no ethnicity is monolithic), but I can’t ignore the prevalence of a virulent, violent homophobia among African-descended communities that exceeds anything I’ve seen elsewhere. You just don’t see this level of violence and hate against gays this often in Europe or East Asia. Why is this the case? What’s the origin of these attitudes? These feelings have to come from somewhere. Is it due to the influence of Islamic norms on West Africa for over a millennium? Is it part of pre-Biblical African culture? My theory is that, perhaps, when places experience severe poverty and day-to-day material insecurity, it shifts the culture to demand more manliness, more images of self-reliance and security. There is no room for men who don’t project that image, who look or act outside the most uber-masculine traits. These phenomena are in overdrive in societies that have experienced extremely impoverished, subsistence lifestyles since time immemorial. The undercurrent in society becomes that “if men aren’t men (in a certain way), we’ll lose everything.” Hopelessness and lack of opportunity for advancement just magnifies this. And then when you add the layer that, in the culture, men can’t gain honor and esteem from battle anymore, and few from riches, so the way they get honor and esteem increasingly focuses on how many women they can get; and that means even less room for gays. That’s my theory anyway. What’s yours?